I have been trying top keep you up to date with The Harmony Guitar's assortment of Guitars. With the new 5th edition of the Blue Book of Guitars there is finally a coherent documentation of the different models of guitars made by the Harmony Guitar Co. of Chicago. I have been able to get an assortment of catalogues from various jobbers and mail order houses that sold Harmony instruments. Most of these are from the 60's and there still is a lot to be learned from the printed information from the earlier catalogues. Any one have any that they can copy for me, it would be greatly appreciated. Especially ones from the pre war period when they were probably making some of their finer instruments. I've said a fair amount about the guitars, but what about all the other instruments that Harmony made. From being one of the largest suppliers of Ukuleles, to the student violins they made, Harmony had an assortment of instruments. Not only did they make a large selection of banjos, mandolins, and other folk instruments, but also I have heard of some of the more unusual instruments they made. One of the more unusual I have heard of was a Model H 1214 Archtone 8 string Archtop guitar. More of cross between a guitar and a Mando cello, this instrument is quite unique. I have had many other type of instruments made by Harmony. 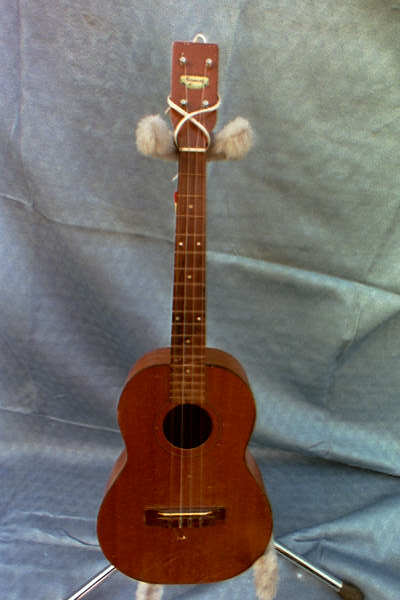 By 1915, the time of the San Franscico exposition when the uke came into the public eye, they were the largest manufacturers of ukuleles in America. Through the 60's they continued to have an extensive line of ukuleles. Their line of 8 models consisted of the No. H685 tenor and No. H695 Baritone Ukuleles. These instruments evolved to being made with selected striped mahogany veneers, by the late 60's. The earlier ones were made of seasoned mahogany, nicely figured. The '62 catalogue lists the Brazilian rosewood fingerboards as a feature. The smaller soprano ukes consisted of No. 125 ?? an excellent beginner's instrument. The No. 119 ? ?d the later No. H 98 had stencil scenes and fingerboards that were "Accurately Molded " out of polystyrene. The Roy Smeck Uke No. 555 continued in the line, as the better soprano uke. This also had this plastic fingerboard by the mid 60's. It was the concert size, and larger, which had a rosewood fingerboard. At $20 list, it was real Harmony quality. Harmony's wide choice of ukuleles, whether it was " for fun or educational purpose? ?e tangible evidence of their leadership." Their baritone ukes and tenor guitars still show up as unplayed cast offs from the main stream of instruments. Harmony's banjo line consisted of the Roy Smeck Model No.8125 Tenor, "as a Professional Banjo with powerful ringing tone" The Deluxe 30 bracket No. 28005 came with " modern RESO-TONE construction "which they claimed to give a snappy brilliant tone. The Standard 16 Bracket, as the others, was available as a tenor or 5 string. The model No. 8000 Tenor was available for a $ 45 list price in the early 60's. This was almost half the price of the of the No. 28125 Roy Smeck 5 string, which was the top of the line banjo with resonator. The RESO-TONE No. R8005 resonator was available as an option. This resonator produced an advanced series of instruments with superior tone, so they claimed, and a powerful banjo "ring and snap." The long neck "Pete Seeger" banjos I've seen are from the late 60's. They have had both the "Holiday" label and Harmony label. This Harmony model H 28132 with a 25 fret, 32 " scale, had a new "Nickled RESO-TONE Rim. These "plastic" instruments also claimed that this "non warping" rim produced a superior tone. The prices didn't change much by the end of the 60's. The No. H28130 Blue Grass Banjo had 22 frets, a traditional 27 in. scale, and listed for $ 75. The "Glamour of the traditional Folk banjo" was made affordable for the avid banjo student by these mass produced instruments. Harmonys assortment of Mandolins was similar to line of guitars they made. By 1968 it consisted of three basic models. The No. 417 Monteray at $ 59.50 was the top of the line. They also had a No. 410 Monteray at $ 40. The cheaper one of these two "F" hole mandolins was bound only on the top with an ebonized fingerboard, not rosewood. Reflecting the quality of the Monteray archtops, of the time, they were an excellent choice for the student. They offered an "A" style No. 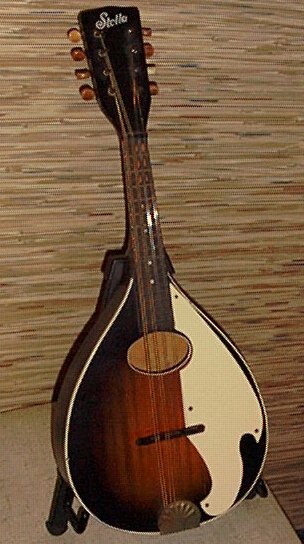 331 Stella Lute Style Mandolin. This had a Flat top and back, with painted binding and reflected the Stella budget line of guitars. They also offered a model No. H35 Harmony Electric Mandolin. "Carefully designed for excellent mandolin tone, and for clean amplification of tone, " boasted the 1968 catalogue. With it's "Gold Tone" DeArmond pickup, it listed for $ 119. With it's pointed cut a way and wavy headstock design, it was the cutting edge for contemporary electric folk instruments. By 1973 they added this design to their acoustic mandolins as a H8025 Harmony Baroque Model Mandolin, "sweeping brilliance of tone and response." The rest of the line remained basically the same with the exception of model number names. They seemed to designate the models as H80** instead of the No. 3**. The name of the models and specs. seems to remain the same. The price went up about a 1/3 in these 5 years. There is still more to come. Harmony's ability to mass produce instruments made them the number one supplier of student instruments. Their selection of folk instruments was as diverse as all the different instruments they made.